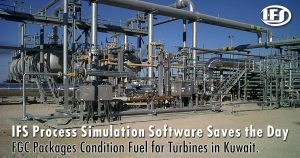 In the bidding stage of this fuel gas conditioning package intended for a client in Kuwait, IFS’s process simulation software identified process issues and opportunities for optimization. Integrated Flow Solutions (IFS) was contacted by Al-Rashed Group which is one of the largest conglomerates in Kuwait. Al-Rashed Group owns several companies including a division for oil and gas related activities. 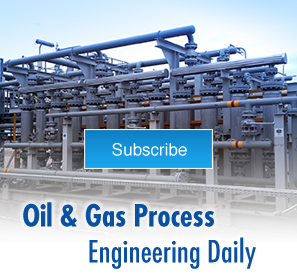 The Kuwait Oil Company (KOC) had floated a tender for construction of a 120 MBOPD Early Production Facility (EPF) in North Kuwait. Al-Rashed was awarded the contract. Al-Rashed teamed up with California-based Process Unlimited who provided engineering services for the project. The project started in 2009 and was completed in 2012. 1.2.1 One (1) Fuel Gas Inlet Separator, V-110. 1.2.2 One (1) Joule Thompson Expansion Valve, PV-V110. 1.2.3 One (1) Condensate Atmospheric Evaporator, E-105. 1.2.4 One (1) Inlet Gas/Cold-Gas Heat Exchanger, E-100. 1.2.5 One (1) Fuel Gas Cold Separator / Coalescer, V-120. The inquiry document also included a preliminary Process & Instrument Diagram (P&ID) which showed the major components in the sequence specified by the FEED (front end engineering design). IFS’s review of the P&ID identified issues which resulted in a discussion with the Process Unlimited and subsequent design optimization. Kuwait Oil Company (KOC) Project No. 3748-007. The client presented IFS with (8) different inlet gas conditions due to varying gas compositions and conditions from the various gas fields. The inlet gas contained H2S so all materials had to suitable for highly corrosive sour service and comply with NACE MR-01-75 / ISO 15156, and NACE TM-0284 (Latest Edition). IFS ran the (8) different inlet gas cases in Aspen Dynamic, a process simulation software to insure dry superheated gas was provided to the plant turbine generators. Here is (1) of (8) Aspen simulation runs. The process simulations provided proper sizing and placement of the major components in the Fuel Gas train as reflected in the IFS Piping & Instrumentation Diagram (P&ID). IFS was the only vendor to provide detailed process simulations of each gas inlet case with our proposal. As a result, IFS’s component sizing and placement was different from all other bidders, reflecting the proper engineering solution. See General Arrangement HP Fuel Gas Conditioning. The IFS Simulation showed issues with freezing within the skid due to pressure reduction. Additionally, since the gas was liquid rich, the drains from the scrubber and coalescers had be conditioned to avoid blockage due to potential Hydrates. IFS provided some unique solutions to address these issues. Please note that Al-Rashed and Process Unlimited were not aware of these prior to IFS pointing them out. Working closely with Al-Rashed, IFS was awarded the contract by Al Rashed to design, build and supply the Fuel Gas Conditioning Package. IFS supervised the successful installation and start-up of the package. See more IFS modular process skids in MENA and elsewhere.